The lady of the house herself, the Witch. 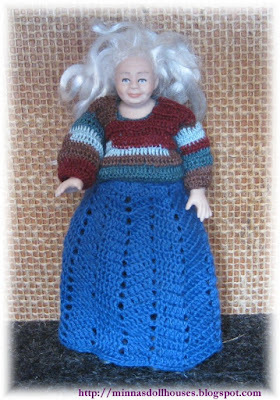 I made her from a Mrs Claus doll kit which I bought from MiniKitz,and I crochted the clothes. Minikitz is one of my favourite online shops for buying miniature supplies. Tein hänet Joulupukin rouva -tarvikepaketista, jonka ostin MiniKitzistä, ja virkkasin vaatteet. MiniKitz on yksi suosikkipaikoistani minitarvikkeiden hankkimiseeen. she is just perfect Minna!! No, she does not look scary at all! Actually I think that she is a nice witch. All witches don't have to be mean and scary, don't they? I believe she is the good Witch of the blog world. If she was a bad witch she would have jet black hair. NOita näyttää juurikin sellaiselta kiltiltä keitosten tekijältä :) Ihanan puvun olet virkannut!! Obrigada,Minna.O seu comentério me deixou muito feliz.Também admiro muito sua criatividade e seu trabalho.Beijos do Brasil.